shower or just to cheer her up. This silver tray holds a chocolate martini mix, apple martini mix and cosmo mix. 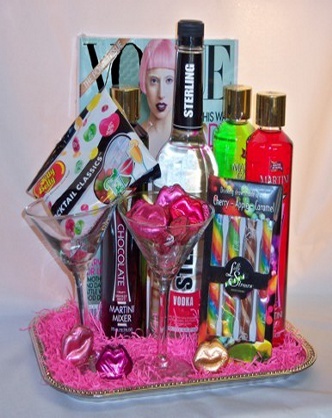 A bottle of vodka, 2 martini glasses filled with chocolates, Vogue magazine, candy drinking straws and cocktail classics Jelly Bellys.